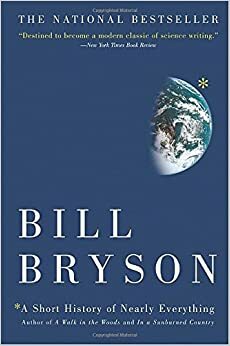 "A Short History of Nearly Everything" by Bill Bryson is really fantastic. It's heavy on the science and math but also includes some history and philosophy. What's great about it is it doesn't just tell you the world is 4 billion years old, it tells you how we know that and goes over the evolution of human thought and how we got to where we are today in each subject. It's also easy to read and the audio book version can be finished in a week of just listening to it during your commute. Telling someone with no philosophy background to try to read 900 pages of Kant is a recipe for frustration. How to Read the Solar System: A Guide to the Stars and Planets by Christ North and Paul Abel. A Universe from Nothing: Why There is Something Rather than Nothing by Lawrence Krauss. Foundations of Astrophysics by Barbara Ryden and Bradley Peterson. Final Countdown: NASA and the End of the Space Shuttle Program by Pat Duggins. An Astronaut's Guide to Life on Earth: What Going to Space Taught Me About Ingenuity, Determination, and Being Prepared for Anything by Chris Hadfield. You Are Here: Around the World in 92 Minutes: Photographs from the International Space Station by Chris Hadfield. Space Shuttle: The History of Developing the Space Transportation System by Dennis Jenkins. Wings in Orbit: Scientific and Engineering Legacies of the Space Shuttle, 1971-2010 by Chapline, Hale, Lane, and Lula. No Downlink: A Dramatic Narrative About the Challenger Accident and Our Time by Claus Jensen. Voices from the Moon: Apollo Astronauts Describe Their Lunar Experiences by Andrew Chaikin. A Man on the Moon: The Voyages of the Apollo Astronauts by Andrew Chaikin. Breaking the Chains of Gravity: The Story of Spaceflight before NASA by Amy Teitel. Moon Lander: How We Developed the Apollo Lunar Module by Thomas Kelly. The Scientific Exploration of Venus by Fredric Taylor. The Right Stuff by Tom Wolfe. Into the Black: The Extraordinary Untold Story of the First Flight of the Space Shuttle Columbia and the Astronauts Who Flew Her by Rowland White and Richard Truly. An Introduction to Modern Astrophysics by Bradley Carroll and Dale Ostlie. Rockets, Missiles, and Men in Space by Willy Ley. Ignition! : An Informal History of Liquid Rocket Propellants by John Clark. Russia in Space by Anatoly Zak. Rain Of Iron And Ice: The Very Real Threat Of Comet And Asteroid Bombardment by John Lewis. Mining the Sky: Untold Riches From The Asteroids, Comets, And Planets by John Lewis. Asteroid Mining: Wealth for the New Space Economy by John Lewis. The Whole Shebang: A State of the Universe Report by Timothy Ferris. Death by Black Hole: And Other Cosmic Quandries by Neil deGrasse Tyson. Origins: Fourteen Billion Years of Cosmic Evolution by Neil deGrasse Tyson. Packing for Mars:The Curious Science of Life in the Void by Mary Roach. The Overview Effect: Space Exploration and Human Evolution by Frank White. Gravitation by Misner, Thorne, and Wheeler. The Science of Interstellar by Kip Thorne. Entering Space: An Astronaut’s Oddyssey by Joseph Allen. International Reference Guide to Space Launch Systems by Hopkins, Hopkins, and Isakowitz. The Fabric of the Cosmos: Space, Time, and the Texture of Reality by Brian Greene. How the Universe Got Its Spots: Diary of a Finite Time in a Finite Space by Janna Levin. This New Ocean: The Story of the First Space Age by William Burrows. The Last Man on the Moon by Eugene Cernan. Failure is Not an Option: Mission Control from Mercury to Apollo 13 and Beyond by Gene Kranz. Apollo 13 by Jim Lovell and Jeffrey Kluger.